This day was probably my last trip to college! (Atleast in the morning!). I was happy to be in the 0658 EMU sitting near a window and staring aimlessly at the now familiar stretch from Belapur to Kurla. I reached Kurla at around 0735. The Mumbai bound Vidharbha Express rushed past with a WCAM3 in charge. The train had 24 coaches. Sometime later the Pune bound Deccan also rushed past with a WCG2 in charge. I was about to take a pic, but the pointsman jumped in between, and taking a photo would have been meaning less! My EMU pulled in, and luckily the coach I travelled in was new! I enjoyed the journey through out, and spotted the Devgiri express with a Green coloured Pune WDM3A. 1. Down journey was by 6345 Netravati Express. The loco in charge was WDM3A #18555 of Erode. (Photo posted in Update 1). The coach was AS3 (WGACCN 05908 based at TVC). 2. I made a short trip to Bangalore. Left Trichur on 07 April in the night by Kallada Volvo (KA 03 AC 2000). The journey was comfortable. Travelogue coming soon. 3. Returned from Bangalore by Car. I drove for about 60% of the distance. 4. Departed from Trichur on 13 April by 6346 Netravati Express. The loco was WDM3A #14080 of Erode (Image above). The coach was AS1 (WGACCN 05138 based at TVC). The train departed from TCR at 1618, late by 28 minutes, and arrived Panvel at 1550, late by 35 minutes. ...WDP4 #20031 of Krishnarajapuram. The loco looked tired, and the train got its starter about a minute after I clicked the image! The rest of the journey to college was plain. I had an examination, and that too was normal! I spotted the new "Solapur-Mumbai-Kolhapur Siddheshwar/Mahalaxmi Express". The loco was a WCG2. Right behind this fellow was the Matsyagandha Express, and behind her was Devgiri Express. Mandovi had WDP4 #20034. The rest was normal. The examination was sort of boring, and quite monotonous! In the evening, I spotted Pragati Express with a WCG2 and the Nagpur bound Nandigram Express with a WDG3A (probably of Pune). Update: It has been confirmed that the Mumbai-Latur-Mumbai Tri-Weekly express gets a Kalyan WDM2 for its entire journey - So that becomes the longest and the only regular express link worked by Kalyan DLS - Kudos to the staff there! Thats all for the day - Bye! The loco that worked 6345 LTT - Trivandrum Netravati Express was WDM3A #18555 from Erode (all the way). The train left Panvel at 1320, delayed by 25 minutes, and reached Thrissur at 1250, delayed by about 30 minutes. Not much about the journey... Will put up more details on reaching back in Mumbai! An unexpected turn to the journey... I made an unexpected dash to Bangalore! I left on April 07 in the night by a VOLVO bus operated by a leading private operator - Kallada. The bus was KA 03 AC 2000. It was a Semi-Sleeper bus, and I had a seat right behind the "helper's" seat i.e., Seat Number 03. The nearby seat too was empty throughout the journey! I'll return to Trichur on 10 April by Car...more later! Just as I had reported a few days earlier, My grandpa passed off on Sunday (April 01). This sad occasion sees me traveling to Kerala once again! I am leaving tomorrow by 6345 Netravati Express, and am expected to reach back in Mumbai by Saturday/Sunday i.e., 14/15 April 2007. I'll surely try to update this blog in between, but it all depends......Do keep visiting often! The day with a sad note! Myself trying to recover from a shock of losing a very near relative (my grandpa), had to witness another grief filled moment today! Just as I posted earlier, the holy soul left this place at 2130 on Sunday. 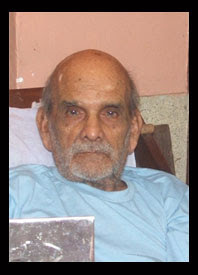 His body was cremated with full religious rituals on Monday, April 02, 2007 at 1200, at our Ancestral house at Pullut, Kodungallur Taluk, Trissur District, Kerala. I unfortunately could not take part in the rituals, since I could not manage to get tickets on any of the Cochin (the nearest airport) bound flights! So, I am back here in Mumbai. But would be leaving on Saturday, April 06 2007 to take part in the rituals that are usually done on the 11th & 12 th day of death as per our Tradition. In remembrance of this holy soul - Sankaran Embranthiri, my paternal Grand Father. He left for his heavenly abode just hours back (At 2100)...he is no more in this world! He was 90 at the time of death. He died due to Cardiac Arrest. In solitude to this heart breaking news, there would be no update to this blog atleast for the next three days. I am leaving urgently to my Native place (Kodungallur in Kerala) by the first available flight.